Get your friends and family together, and join us for the annual 2017 MJFC Trivia Night! Hosted by MJFC’s very own trivia guru – Gav Dougherty – this is one of the most popular events of the year! 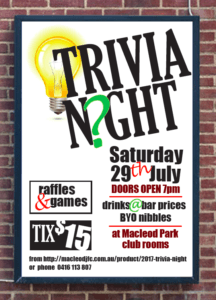 Join us for a night of fun and laughs as we battle to find out – who are Macleod’s Trivia Champs! BYO nibble, drinks at bar prices. Call Paul on 0416 113 807 for any other info.